Figure 5: Ultrafiltration has a number of niche industrial applications, including in biogas plants. Figure 6: Ultrafiltration membranes have become widely applied throughout water and wastewater treatment. 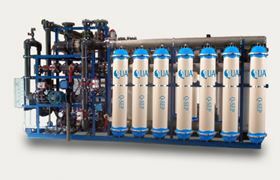 Ultrafiltration (UF) is a membrane separation technology that has traditionally utilised crossflow to prevent excessive build up of contaminants on the membrane surface, and control the rate of fouling. In crossflow operation the flow regime within the membrane pores is laminar, so it is desirable to create turbulence in the feed channel to enhance shear at the membrane surface, and improve mass transfer rates. Crossflow velocities normally create turbulent or transitional regime conditions in the feed channel, providing a highly effective method of cleaning the surface from accumulated particulates. However, the major disadvantage for large scale projects is the size and cost of the crossflow pump needed. Directflow operation is now the membrane process of choice for water treatment applications. In most water sources, feed solids loadings are normally very much lower than for process or waste stream feeds used in crossflow applications. This has allowed membrane companies to develop an alternative to crossflow. At first, crossflow velocities were reduced to a bleed flow, and then stopped altogether, relying simply on an intermittent backwash. This type of operation is called directflow, or semi dead end, and is illustrated in Figure 1. With the elimination of crossflow, it has become possible to use much finer feed channels, since filtration cycle pressure drop ceased to be the limiting factor. This increased the packing density of the module greatly, and the combination of low capital and operational expenditure has opened up the market for large scale water treatment. UF membranes are defined as having a pore size in the range 0.001-0.02 μm and they retain fine particles, colloidal material, bacteria, viruses and some other pathogens and pyrogens such as endotoxins. In contrast, microfiltration (MF) membranes typically have a pore size of greater than 0.1 μm, and hence will not remove colloids or all viruses but they are efficient at removing bacteria and fine inorganic particles. Reverse osmosis (RO) separates dissolved material and operates in the range below 0.001 μm. In a pressurised UF system trans-membrane pressure (TMP) is generated in the feed by a pump, while the permeate stays at atmospheric pressure. Membrane modules are generally standardised, allowing the design of membrane systems to incorporate membranes selected for the application. UF systems can also be provided in an immersed configuration. Here membranes are suspended in basins containing the feed and are open to atmospheric pressure. Pressure on the influent side is limited to the static head above the membranes with TMP generated by a pump that develops suction on the permeate side of the membrane. UF, like other filtration methods, can be operated as a continuous or batch process. We asked Graeme Pearce, a specialist in the application of UF technology at Membrane Consultancy Associates Ltd, for some background on the development of UF technology in recent years. He told us that UF has been used for large scale water treatment applications since the mid 1990s. Initially, membranes were felt to be too expensive, unnecessary, or the applications too difficult. However, legislative drivers in drinking water treatment led to a gradual adoption of the technology. As sales volume increased, prices fell, and eventually membranes have become widely applied throughout water and wastewater, both for direct filtration applications and as a pre-treatment to RO. 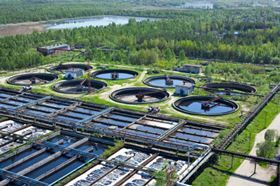 Wastewater applications have seen growth in the deployment of membrane bioreactor (MBR) systems, which employ UF or MF membranes, depending on the nature of the waste. Pearce explained that the initial focus for the development of membrane technology was on material choice. Several polymers were used in early products, but the focus in current products is mainly on the use of polyethersulfone (PES)/ polysulfone (PSF) or polyvinylideme difluoride (PVDF). Though the market is now settled with well-established products, there are still significant improvements being introduced each year by the market leaders in the fibre chemistry of the main products. Initially, many companies entered the market, but this was followed by a period of consolidation as market leaders emerged. A further development highlighted by Pearce has been in the design and size of modules. In recent years, several companies have increased module dimensions to allow more membrane area per unit. In the early days of the market, attempts to do this resulted in inefficient use of the additional area, which can lead to premature fouling. However, these problems have now been overcome with improved efficiency of module internals, with the result that newer products have much better economics. Pearce went on to explain that, at the same time, RO manufacturers entered the market to exploit the synergy between UF and RO, since UF acts as an effective RO pre-treatment stage. The most recent trend is for companies from emerging economies such as China and India to enter the market. Though the impact of these new entrants is still limited, it is expected that they will become more influential, especially with the growth of their domestic markets. This article provides a profile of systems from a cross-section of suppliers in a variety of applications. The case studies showcase the complete spectrum of UF/MF companies with market leaders, new entrants, and applications in emerging economies. Part of the BASF group since August 2011, inge GmbH has won a contract to provide UF-treated water to China’s largest RO facility, treating 110,000 m³/day of seawater. The contract for the pressurised UF system was awarded in 2010, the official opening ceremony took place in October 2011 and the plant started operation this year (see Figure 2). In the city of Tangshan on the Yellow Sea, the Chinese plant constructor Hangzhou Xidoumen is building the system in the Caofeidian industrial area, and the treated water will be used to supplement resources in Hebei Province, the area around Beijing. The 24th Global Water Intelligence and IDA Worldwide Desalting Plant Inventory indicates that the total capacity of all desalination plants stands at 77.4 million m³/day, and that there are now 16,000 desalination plants worldwide in 150 countries. With an average production per plant of nearly 5000 m3/day, the system in Tangshan will be one of the biggest projects of this kind anywhere in the world. China is the world’s biggest and fastest-growing market for water treatment systems. German company inge has operated a sales office in this important growth market since 2004. In the eight years since the office opened, the company reports that it has engineered more than 40 plants with its membrane technology for treating drinking water, process water and wastewater, including Terminal 3 of Beijing International Airport and a wastewater treatment plant in Dalian. The Tangshan project will require 1,536 UF modules. To support the construction of seawater desalination, the Chinese National Development and Reform Commission announced this project as “a key demonstration project”. Mr. Zhang Jiehui, vice-governor of Hebei Province spoke highly of the project. A project of this magnitude demonstrates the effective synergy that has developed between UF and RO technology. According to the chief executive officer of inge, Bruno Steis, in addition to the demonstrated reliability and quality of the German-made UF membranes and modules, the key to inge’s success has been the benefits offered by its T-Rack technology, an integrated module/rack system that is versatile, of compact design and represents cost-effective engineering. The T-Rack system, inge advises, has a footprint that is up to 60 percent smaller than conventional rack systems, reducing the overall capital cost of a typical UF system by at least 5 percent, depending on the scale of the system being installed. Membrane resilience is another key factor, according to inge. To date, the company says it has more than 500 UF plants operating worldwide without a single case of broken membrane fibres reported. A warranty against fibre breakage is offered by inge. The popularity of UF as pre-treatment to RO in seawater desalination is confirmed by Polymem who also cite wastewater tertiary treatment as an increasing market. Polymem has launched the GIGAMEM® UF240 module for these markets and also closed system applications such as UF prior to desulphation in offshore oil exploitation. 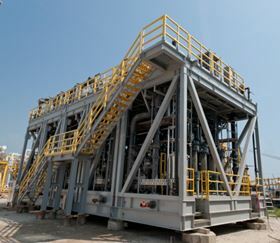 Offshore oil production often requires the injection of water into the reservoir to maintain pressure and improve sweep efficiency. When the water already present in the oil reservoir contains barium, the injection of seawater containing sulphates (the only available resource for the production of injection water) may cause the precipitation of barium sulphate in the reservoir and result in obstruction of wells. Seawater desulphation is provided by nanofiltration (NF), with pre-treatment by the Polymem UF system, with modules developed specifically for this application to meet the challenge of the high production flow required, weight and small footprint to be reached, and continuously high treated water quality. Polymem has designed and developed a unique pressurised UF module with a tight pore size (0.01 μm) that meets these constraints allowing the feed to the NF system to reach a silt density index (SDI) consistently lower than 2 from seawater. The UF elements are positioned in a high capacity module, allowing operation at high temperatures and pressures. Each GIGAMEM module can produce typically 35 m3/hour of ultra-filtered seawater; it is composed of a self-supported vessel made of composite material to resist corrosion and has removable membrane elements. Polymem says that investment and operating costs are reduced compared to traditional membrane modules because the modules’ supporting frames become redundant and the replacement of membranes at the end of life does not require the replacement of the vessel. One of the biggest constraints in the construction of offshore platforms is the weight of the facilities. A design using GIGAMEM typically weighs half that of a treatment plant comprising multimedia filtration of the same processing capacity. Polymem extensively tested a system for Total on the Girassol oil platform and successful results allowed the commercial development of these modules for large-scale projects. Now, Cameron International Corporation, USA, has chosen Polymem modules for the pre-treatment of seawater by UF on various offshore platform projects (see Figure 3). Three plants for the oil companies: Total, BHP Billiton, and Pemex, treating 40,000 m3/day, 25,000 m3/day and 10,000 m3/day respectively, have already been secured thanks to this technology and the commercial partnership. Polymem also offers the GIGAMEM for onshore pre-treatment of seawater before RO for drinking water production, high capacity freshwater treatment plants as well as for tertiary treatment of wastewater. Polymem has developed ANSI/NSF 61 approved hollow fibre membranes made of several materials, including tight pore size hydrophilic PSF and hydrophilic PVDF for applications where high chlorine resistance is required. For tertiary treatment applications, the module can be utilised as an alternative to MBR systems. The 0.01 μm pore size enables a better retention of viruses and organic matter, according to Polymem, than MF membranes or ‘high UF’ (0.04-0.09 μm) membranes generally offered in MBR systems. Also, threshold molecular cut-off in maintained over time despite MBR membranes being subjected to strong abrasion phenomena. Polymem maintain that the permanent and successful capabilities of disinfection and organic matter reduction are essential to ensure better quality permeate, whether reused or recycled on site especially when further RO/NF final polishing treatments are used. We have seen the importance of pilot testing by Polymem in the development of its desulphation technology. QUA has also undertaken pilot trials extensively, an example being a trial of its Q-SEP® hollow fibre UF module in India. Q-SEP modules (see Figure 4) contain UF membranes manufactured with QUA’s patented ‘Cloud Point Precipitation’ method, a process that ensures a high pore density along the length of the fibre and uniform pore size distribution in the membrane. Q-SEP says that its modules deliver superior performance characteristics and product water quality, the membranes available with 0.8 mm internal diameter (ID) fibres suitable for feed water with low turbidity and 1.2 mm ID fibres suitable to treat water with higher turbidity. Q-SEP UF membranes are made from hydrophilic PES that provides high fibre strength and excellent low fouling characteristics resulting in higher productivity. These hollow fibre membranes operate under low TMP in an inside-out flow configuration. The fibres in the Q-SEP module are held firmly in place, which reduces the stress on the fibres even at high flow velocities. Uniform fibre packing limits the pressure drop variation within the module and prevents localised high fouling conditions, producing a permeate with a SDI typically less than 1. Q-SEP eliminates the need to add coagulant chemicals for most applications. Q-SEP UF membranes were tested in a pilot unit at the PPN power generation station, located in Tamil Nadu, India. The goal of the pilot study was to examine the performance of the Q-SEP membrane as a precursor to the facility’s seawater RO system. The source is raw seawater from an open intake, and it was a challenging application because of wide feed turbidity variability. The existing pre-treatment on site consisted of seawater chlorination, a solid contact clarifier, and two-stage media filtration. As the feed water to RO membranes is required to have a SDI value of less than 3, the primary purpose of this pilot testing was to measure the SDI of the UF product water as well as to study the performance of the Q-SEP module with regards to service flux, duration of service, TMP, solid loading capabilities, turbidity of the feed and UF product water, SDI of UF product, and frequency of chemically enhanced backwash (CEB). The pilot unit included all necessary pumps, tanks and the online instrumentation necessary for recording parameters such as flow and pressure. To aid CEB, the provision for caustic dosing, sodium hypochlorite dosing and hydrochloric acid dosing was included. The Q-SEP 4208 module tested has a surface area 42 m2 with 0.8 mm ID hollow fibre membrane manufactured from PES. During this test, the feed and product flows were maintained at 4 m3/hour. The pilot operation was based on a service flux of 96 l/m2/hour, the turbidity of the clarified water feeding the UF being 6-20 NTU with short spikes up to 50 NTU. The service cycle operation was set at 30 minutes followed by a backwash for one minute to ensure that the membrane pores were kept clean and free of any suspended particles. CEB was performed when the TMP value reached around 0.4 bar. After CEB, the TMP dropped back to 0.25 bar, which is the initial clean TMP level. Coagulant was not dosed upstream prior to the UF unit. There were no operational issues during the trial despite operating at a high flux with the product turbidity consistently below 0.1 NTU and the SDI consistently below 1 during this testing period. CEB was performed whenever the TMP rose to 0.4 bar and the TMP dropped to the initial value. These results concluded that the Q-SEP membrane is an excellent option as pre-treatment feeding a RO system. They also underline the need to carry out effective pilot trials as part of the design phase of any UF project to ensure the nature and variability of the feed water supply is fully characterised. UF has a number of niche industrial applications in the filtration and separation industry. UF has a number of niche industrial applications in the filtration and separation industry. 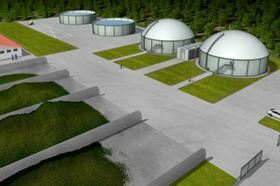 One example utilises technology developed by atech innovations GmbH and involves the treatment of fermentation residue substrates from biogas plants. The growing number of biogas plants makes it increasingly difficult to return waste fermentation residue substrates to green spaces or arable land. Managers of large-scale plants are often unable to find sufficient disposal options within an acceptable distance. Hence, it can be economic to treat fermentation residue substrates in such a way that they can be discharged and re-used in the form of free flowing solids and nutrient-poor process service water. Treatment steps implemented by atech include liquid-solid-matter separation using ceramic UF membranes and RO. For the filtration of liquids with highly abrasive components (such as undissolved macro-molecules in fermentation residue substrates) a rugged membrane, Duratech, has been developed, manufactured from titanium oxide. Due to an innovative coating process based on controlled crystal growth, Duratech has a high abrasion resistance proven by standardised scratch test measurements. In the treatment of fermentation residues, UF using ceramic membranes is used to separate solids and dissolved macro-molecules, eliminate viruses and bacteria, retain the fermented biomass and remove particulate chemical oxygen demand (COD). During crossflow filtration by these ceramic membranes the medium to be filtered flows through the channels of the membrane support with particles/molecules exceeding the pore diameter of the membrane being retained, with permeate receiving further treatment in the RO system. Additionally, MICRODYN-NADIR has outlined other applications including the possibility of using membrane technology for trace substance elimination, and the optimisation of the overall biological process in MBR systems are now being widely investigated. To maintain flux rates, especially in industrial applications, effective cleaning is required. This can comprise the frequent low intensity cleaning described in the Q-SEP process above or less frequent cleaning-in-place (CIP) of the membrane system, which would be periodically taken offline and traditionally acid/alkaline solutions used to remove inorganic/organic material. The newly developed mechanical cleaning process (MCP) for MBR systems is an innovation from MICRODYN-NADIR. One of the biggest challenges in implementing MBR technology compared to conventional wastewater treatment plants is the relatively high energy demand of MBR systems. In order to optimise MBR systems to reduce energy demand specifically, the BIO-CEL®-MCP process utilises granulates to clean the membranes mechanically. According to MICRODYN-NADIR, the MCP process runs with almost chemical free operation and even more importantly can result in a significant enhancement of flux. In turn, not only the membrane area required can be reduced but also the required volume of the filtration tanks will be significantly smaller. Hence, the overall energy consumption can be reduced with studies by MICRODYN-NADIR showing that the mechanical cleaning process can result in savings in energy and chemicals of up to 27%. In addition, when using an MBR with MCP, process stability as well as operational safety is increased. We have seen that UF membranes have become widely applied throughout water and wastewater treatment, both for direct filtration applications but primarily on large systems as a pre-treatment to RO, such systems exploiting the process benefits of the synergy between UF and RO systems. We have seen increased module dimensions allowing more membrane area per unit or reduced plant footprint, with the result that newer products have much better economics. European and North American companies continue to dominate the knowledge base driving the industry forward. Neophil membranes have been granted NSF/ANSI 61 certification for drinking water production. The desalination plant, in Queensland, is based on a SWRO (Sea Water Reverse Osmosis) process which includes reverse osmosis and ultrafiltration membranes.